The owners of this home in Toronto wanted to cover half of their deck to protect it and their children from the sun. 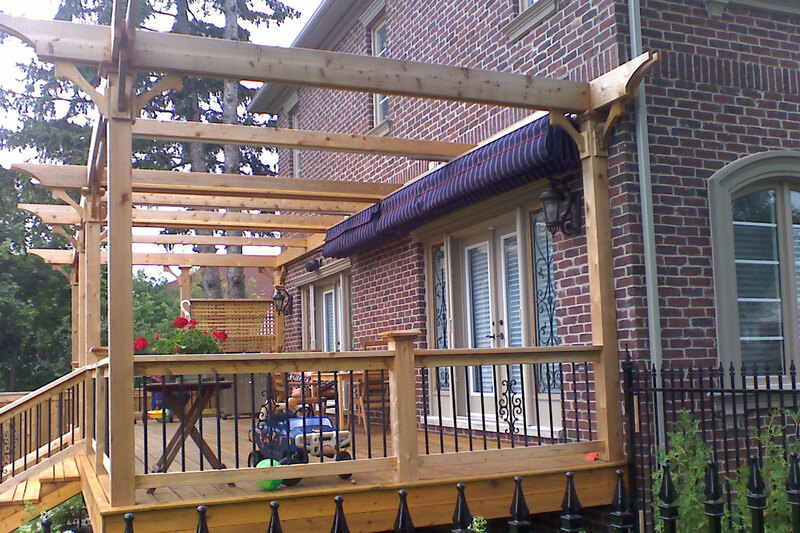 The decision to have two canopies side by side was made at the time of the frame design. 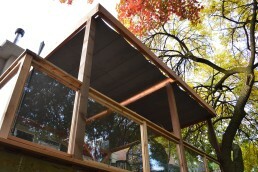 As a result, each canopy is neatly integrated into its own box frame. Notice each of the motorized tracks is recessed in the beam that supports it. 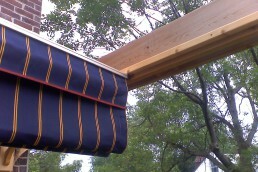 This is easily done by separating the double beam, with a 2” wide insert (must be a full 2” wide). The beams on the outside are 2×10’s. The insert is a rough (not finished) 2×8, and the resulting gap is 2” shorter. Notice how nicely it accepts the drive beam. The side by side arrangement here would normally have each canopy tilted away from the gap between them. This would be to shunt rain runoff to the edges of the overall covered area. 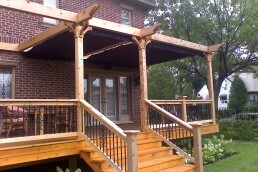 In this case, because the protection is for the sun only, the canopies are installed level to the deck. These pictures were taken shortly after installation. The wall later had a fascia added to stop the fabric from touching the brick in wind action. Sunbrella is particularly susceptible to abrasion and should not be allowed to rub against asphalt shingles, brick, or stucco. The fabric chosen has a beautiful effect in the sun. The gold stripes light up relative to the darker blue background and create a really dramatic effect. This effect is even more dramatic when Sunbrella Cooper Black is the fabric. 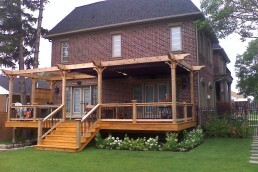 This is a project by Hickory Dickory Decks of Dundas, Ontario. 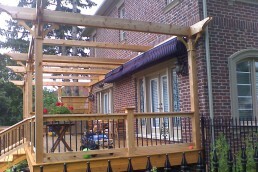 The owners of this home in Toronto wanted to cover half of their deck to protect it and their children from the sun. The decision to have two canopies side by side was made at the time of the frame design. As a result, each canopy is neatly integrated into its own box frame.